>> I WILL ONLY RESERVE ITEMS WITH A DEPOSIT, DUE TO LAST MINUTE BACKOUTS. TQ FOR UNDERSTANDING! >> ALL ITEMS ARE READY STOCK, UNLESS STATED. >> INSTALLMENTS ARE ALWAYS ACCEPTED! >> LAST MINUTE BACKOUTS WILL BURN YOUR DEPOSIT! Please read the Terms & Conditions before placing an order. You are hereby agreeing to the Terms & Conditions of Urbane Mannequin & Hombrebyum. We reserve the right, at our sole discretion, to change, modify or otherwise alter these terms and conditions at any time. 1.) We are looking for fast deals therefore it is a first pay, first served basis. We don't tolerate rude, impatient and fussy buyers. Back-out buyers will not be entertained. 2.) All of our merchandise are 100% ORIGINAL & AUTHENTIC. We do not sell imitations, knockoffs, 1:1 grade, fakes etc here. Purchase and wear with confidence. 3.) All sales are final. We do not provide RETURNS or EXCHANGES. Deposits are NON-REFUNDABLE for both ready stock & pre order items. 4.) Prices are FIXED and NON-NEGOTIABLE. Prices may change from time to time. We reserve the right to alter the prices at any time without prior notice. 5.) Pre order items may take 2-4 weeks (subject to customs clearance). Some cases may take longer due to unforeseen circumstances such as custom clearance. 6.) Please do not place an order if you can't wait and read carefully on the status of items (ready stocks/pre-order) and descriptions before sending enquiries. 7.) Cash installment are accepted. We reserve the right to cancel any reservations if the balance payment is not made within the initial agreement between buyer and seller & your deposit will be forfeited. Please respect mutual understanding between both parties. 8.) Items are available for pick up at the Urbane Mannequin Showroom by appointments. 9.) All items will be sent via Poslaju within 24-72 hrs after full payments are received and cleared (unless stated otherwise). Tracking numbers will be provided via email/WhatsApp. All items are checked & are in good conditions, We will not bear responsible for any loss/damages incurred during local delivery. - All of our bags are purchased from official factory outlets, department stores or websites. - Item may or may not include a dust bag, care card, etc. We will include whatever that is provided by the merchant/supplier. - Item colour may vary from the displayed photos due to the resolution and lighting. We cannot guarantee that the colours shown will be accurately represented with the goods received. - All watches comes with the original manufacturer’s serial number, intact and untampered with. The packaging of each watch would depend on the model number purchased. - Original boxes and manual along with manufacturer’s warranty are included with every watch purchased, thus assuring you that they’re authentic products. - Some of the watches may include international warranty but most of these watches has USA warranty only. - The battery may be drained during transit or after being stored in the warehouse. We are not responsible for replacement of the battery in any case that it stops upon arrival at your doorstep. - None of these watches are replicas, rejected goods etc. 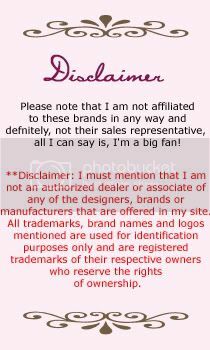 I am not an authorized dealer or in any way associated with the designers, brands, or manufacturers that are offered in my site. All trademarks, logos and brand names are for identification purpose only and are registered trademarks of their respective owners who reserved the rights of ownership. Question : Are these items authentic/original? Answer : 10,000 times YES! No fakes or imitations items here. All items are from California, USA! Question : Coach, Kate Spade (to name a few) made in China? Fake or Authentic? Answer : Asian labour is way cheaper compared to western part of the country therefore most of the designer brands now outsource their production to the Asian country such as China. Any brand that originates from a specific country may not necessarily be "made in" that country. For example, most Longchamp bags are now made in China because of cheaper labour cost, materials/resources. Question : Pre order items ETA 2-4 weeks? Answer : Shipments are done by batch, most items are ordered online so it takes time for it to arrive to my US address and then be shipped to Malaysia. Patience is virtue my darlings! Answer : Some items are restockable but some are just NOT. It depends on the availability of the item in stores. My tip is place the deposit as soon as you can! Question : Do they include dust bag, box, paperbag, etc? Answer : Some items do come with dust bags and such but some just dont. I will include whatever is given by the merchant/supplier. A simpler concept is "Pay less, less frills". Question : Why are the price offered a lot cheaper compared to boutiques in Malaysia? If the link does not work, please e-mail me. LIKE to get LATEST UPDATES!